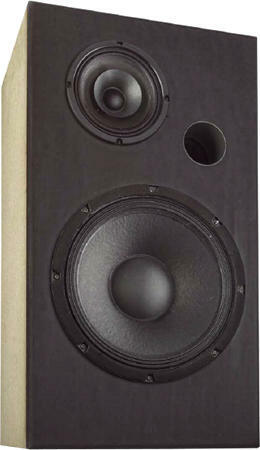 The Noun is a FAST (Fullrange and Subwoofer Technology) speaker with drivers from Sica. The kit is delivered with the Sica 6 D 1,5 CS 8 as fullrange driver and the Sica 12 S 2,5 CS 8 for the bass range. Noun is developed by Olaf Schauer und Wolfgang Vollstädt. The crossover consists of a 2nd order low-pass filter (12 dB per octave slope) for the woofer. The fullrange driver is connected to a 12 dB high-pass filter, a voltage devider, and a blocking circuit. The frequency response of this speaker is linear on axis (with typical resonances of fullrange speakers) and with a slight bass boost at 80 Hz. The decay spectrum is without faults. At low volume, i.e. 95 dB at 1 m, the nonlinear distortions are mostly lower than 1% above 500 Hz and stays below 1% (except between 2 and 3 kHz) at 105 dB at 1 m .
The high-end kit is delivered complete with backlack coils for minimizing microphonic effects. - The current flow through the coil creates a magnetic field which sets the reel of wire in motion. This motion induces a voltage in the coil which adds itself to the signal. The stiffer the reel of wire is, the less the signal will be altered. All capacitors are foil type and for the fullrange driver high quality polypropylen (MKP) capacitors are used.